How to Convert WMV Files to iMovie 11, 10.0 Editable Format on Mac OS X? iMovie is a video editing software application for the Mac and iOS (iPhone, iPad, iPad Mini and iPod Touch). iMovie imports video footage to the Mac using either the FireWire interface on most MiniDV digital video cameras or the computer's USB port. It can also import video and photos files from a hard drive. With iMovie, users can edit photos and video clips by adding titles, themes, music and effects. If you happen to own great amount of WMV files on your computer, you are out of luck to import WMV files to iMovie for editing since WMV is not compatible with iMovie. Never mind, there are many apps can assist you to achieve the goal of converting WMV to iMovie editable format. To perform the conversion, you can adopt Pavtube HD Video Converter for Mac, a professional yet simple to use application which help you to convert WMV to iMovie imported MPEG-4, MOV, DV, HDV etc formats in just one click. For fast and smooth workflow of WMV files with iMovie, you are recommended to to encode WMV to Apple Intermediate Codec(AIC)(*.mov) codec. More over, the program also enables you to convert other incompatible file formats such as MXF, MP4, Video_TS or camcorder files to iMovie for convenient editing. Step 1: Import WMV files. Start up the program on your computer, on the top menu bar, click "File" > "Add Video/Audio" or "Add from folder" to import source WMV files from your local drive to the computer. 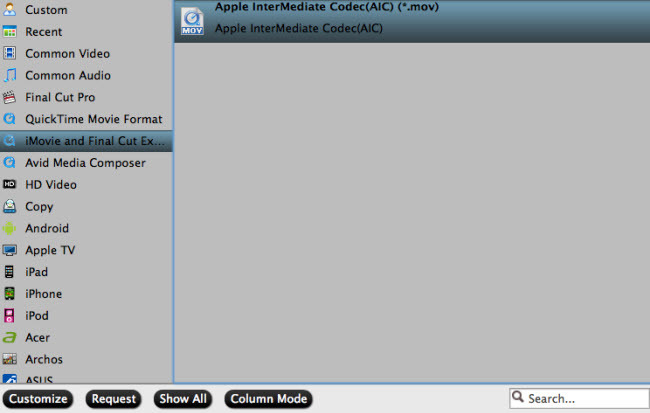 Step 2: Output iMovie supported format to output. Go to "Format" bar, from its drop-down list, select "iMovie and Final Cut Ex..." > "Apple Intermediate Codec(AIC)(*.mov) format. You can also choose to output other iMovie editable "MOV" or "MPEG-4" from "Common Video" extended lists. Step 3: Start WMV to iMovie conversion process. After all the settings is completed, hit right-bottom "Convert" button to start to convert WMV to iMovie compatible format. When the conversion is done, click "Open output folder" button to get converted WMV files imported to iMovie. How to Import Blu-ray to iMovie on Mac? How to Import XAVC Video Footage to iMovie/FCE for editing on Mac? How to Import H.265 Video to iMovie on Mac?